Yesterday, my mom asked me if I was going someplace, why I was so dressed up. I was wearing a t-shirt and a gym skort with my hair wet from the shower. I know I am usually pretty slovenly these days but it was a little unexpected. I didn't think I had extended any unusual effort. "You look so nice!" she gushed, "are you wearing makeup?" My mom is not prone to obsequious compliments so I was sort of suspicious. "Uh, no. Well, I do have on some concealer and a little blush…"
"You look like you have eye makeup on! You look like you're going out or something." "Umm no. Just concealer and blush." "Can you go get it? I want to try it on!" So I ran upstairs and got my secret weapons: Tarte dark circle defense natural under eye corrector and natural beauty cheek stain. 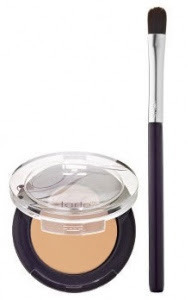 The dark circle defense comes with its own brush that lets you get the coverage you need without being too cakey or mask-like. The blurb on the website claims that dark circle defense "is clinically proven to reduce the appearance of eye puffiness in just 4 weeks. Finely milled light refracting minerals actually brighten skin to help camouflage dark circles, puffiness, refness, fine lines and wrinkles." I honestly don't doubt it. My saggy baggy eyes are looking a bit brighter these days. I was surprised because there are only two shades offered and my skin tone is usually pretty hard to match but the medium-to-deep shade worked on me and on my darker-skinned, tan-loving mom. The cheek stain is in a no-brainer push up stick that you can dab on anywhere (I like it on my cheeks and lips) and blend with your fingers. 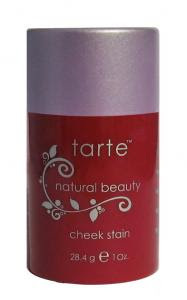 There are a dozen or so cheek stain shades to choose from, but the natural beauty is their completely-green version, with natural ingredients and colorants and their proprietary T5 blend of antioxidant superfruits. Even the packaging is recyclable! And the shade is totally perfect, despite looking like a black cherry push-up pop; you can use it sheer or layer it on for a richer color. Seriously, Tarte has made makeup so simple that even I can do a passable job. My mom was so impressed, she decided she needed to order a zillion things off the Tarte website. 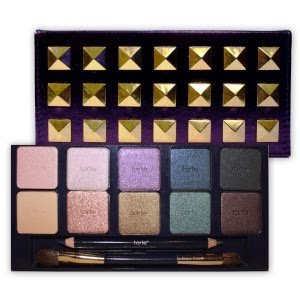 You should, too, if you're in the market for beauty products: Through Monday, August 24th, you can get 40% off of everything in the store (even the super covetable Femme Fatale eye palate pictured below) by using code FF09 at checkout. GAH, I wish I'd seen this yesterday! Which begs the question - why can't I get your blog through Google Reader? I get a message that says "The feed being requested cannot be found."